Puttu with Kadala Curry is a popular Kerala breakfast. We made Puttu with Kadala curry for breakfast yesterday. I took photographs. But I didn’t get time to post it. It's not much fun cooking for myself. My husband is a Naval Officer posted on a ship in the Andamans. He should be transferred to Kochi by June. I am counting days to when we can be together as a family again. My 3 yr son Rohaan has gone to Kannur with my mother-in-law for 10 days. He’ll be back on Sunday. The satisfaction in cooking is seeing your loved ones relish the food you made. Anyway Tania was more interested in eating just the Kadala. I’d pick them from the curry, peel them and give to her. She had more than half a cup. For a 2 year old that’s adequate protein for breakfast. She ate a plantain too. I made the kadala curry with white kadala rather than the standard brown ones. 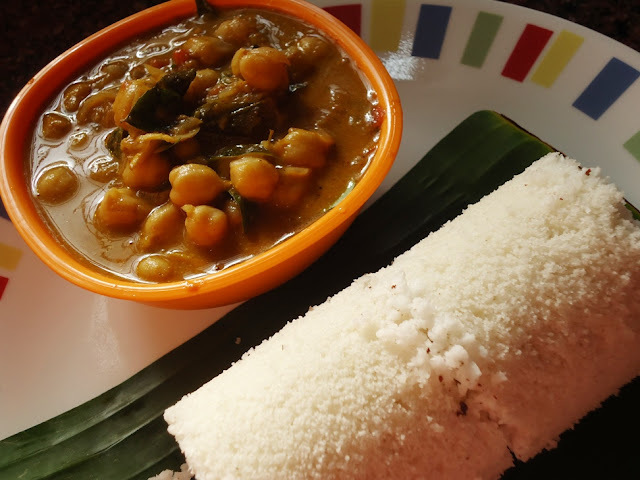 Though Puttu and Kadala curry are the classic combination,it can be had with sweet combinations too. 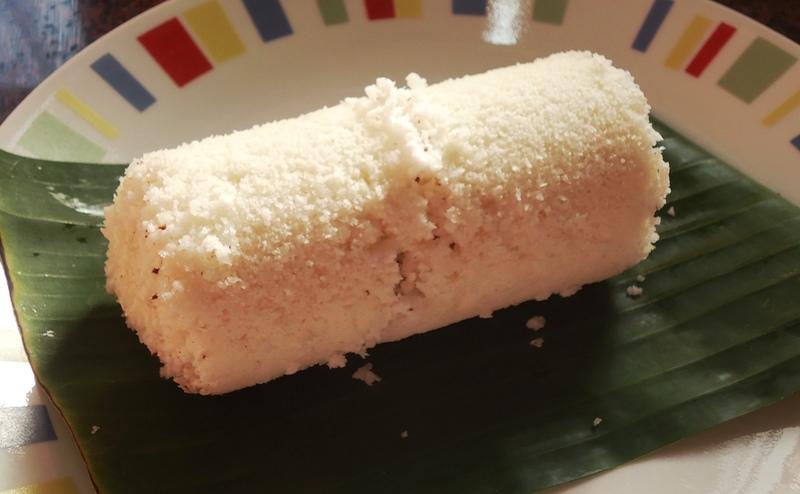 I remember my childhood days in Kottayam, of eating Puttu with lots of ghee and sugar. Honey and plantains makes a lovely combination with puttu. Ammachi used to serve steamed bananas with Puttu with a thinner version of honey called Paani. She sometimes used to add ripe jackfruit bits to the puttu powder. Puttu is made in Puttukutti/ puttu-maker. Mix salt in water and add the water little by little to the rice flour and mix it till the powder is moist and resembles fine breadcrumbs. If too much of lumps is formed just run it in the blender for a few seconds. Keep aside for five minutes. Put one tbsp of coconut on top of the round metal disc inside as the first layer in the puttu-maker . Add the rice flour till half, then add another tbsp of coconut. Repeat the process, till the mould is filled. Do not press in or pack tightly. Closethe lid. Fill water in puttu kudam (pot). Place the puttu kutti on the puttu kudam. Cook it on medium flame for around 5 minutes till steam comes out of the holes in the lid. 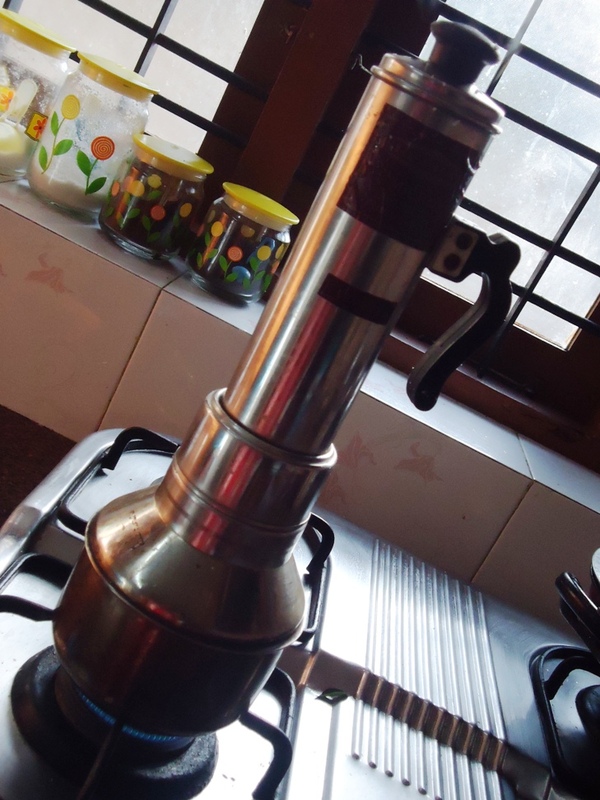 Remove the cylinder from the pot. Push out the puttu on to the serving plate with the metal rod provided with the puttu-maker. We buy readymade Puttu powder. I prefer Nirapara for putuu and Brahmins for iddiappam. To make Puttu powder: Soak the rice for two hours and strain it. Spread the rice in a cloth or a plate and allow them to dry. Grind the dried raw rice to a fine powder in the mixer. It shouldn’t be too fine though. Roast the powder for 5 minutes. Stir it well, while heating. Allow to cool. Keep in an airtight jar. Has a shelf life of two months. Can add bits of jackfruit to the Puttu powder. Can add 2 tbsp Egg masala or chicken masala as layers inside for a fancier version.